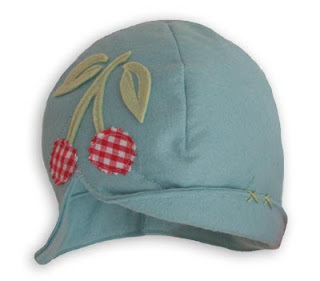 I'm saving my pennies for this little baby hat. We don't plan on having any little ones any time soon. 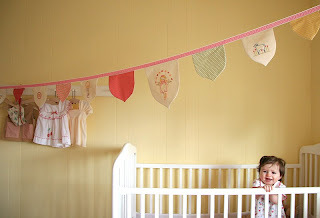 But I've decided to start some baby themed projects anyhow. If I get good at embroidery, my baby shower gifts are going to rock. This banner is what I want to work up to. I feel bad that I stole the photo from somewhere a while back and I don't know who the super cute baby is. I love this banner, and I am determined to copy it. Well, I'll change it up a bit. I'm not so into pink. It's a good thing that I have some time to save up for this hat. It's a little pricey. But I need to have it. I'll put it away in my hopechest. TOO CUTE. This is cute. The funny thing is that I've already seen you decorate with baby dresses. Totally your thing. I was thinking about this. It actually would be really easy to make. Really cute idea......one day it will delight my grandchild. You crack me up with your anonymous posts. I know you can't wait for a Grandbaby. Don't worry, I'll let you help me pick out cute clothes. One day. Patience. I love you. Keep posting, it makes me happy.